The Society of Music Theory (SMT) is the professional organization of music theorists, promoting the development of and engagement with music theory as a scholarly and pedagogical discipline. Since 1995, the executive board of this international organization has granted Lifetime Memberships to certain members in recognition of their truly outstanding contributions to the field. 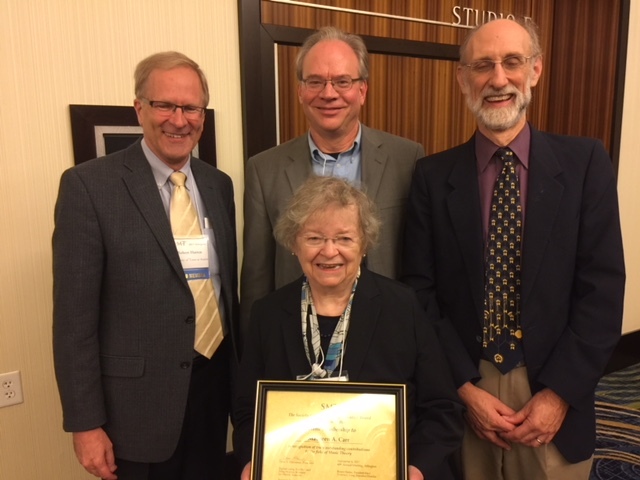 Congratulations to Penn State distinguished professor Maureen Carr who received this honor at the society's 40th annual conference, held recently in Arlington, VA. Professor Carr was introduced at the award ceremony by her faculty colleague, Taylor Greer, who wrote the following tribute.